Hilo is on the east coast of the Big Island of Hawaii. which is the wet side of the island. Although the temperatures are nice and warm, it rains in Hilo virtually every day, and the area has the tropical vegetation to prove it. Hilo is a contrast to Kailua-Kona on the other side of the Big Island, since it is less tourist-oriented, giving the visitor a glimpse of the Old Hawaii. Kilauea Volcano is less than one hour’s drive south from Hilo, so I made several trips to see the sights in Volcanoes National Park and nearby areas in my rental car. The North Coast of the Big Island is rugged, tropical, and mostly inaccessible, however the road along the coastline north from Hilo provides easy access to some of the gulches and valleys, rivers and streams, spectacular waterfalls, and of course the coastline itself before the road veers off to Waimea. Stopping along the way will provide you with a glimpse of how Hawaiians live day-to-day. The Imiloa Astronomy Center is located in Hilo, and presents astronomy to visitors using interactive displays, a planetarium, special exhibits, and ties astronomy to Hawaiian customs and culture. Imiloa is run by the University of Hawaii on behalf of the big multi-national observatories located atop Mauna Kea. Worth a half day visit. Admission charged. Hilo Bay & the shoreline along Kalanianaole Avenue presents fascinating vistas of the geography surrounding Hilo, so it is a good idea for visitors to familiarize themselves with the bay and the Pacific Ocean beyond. There are numerous civic parks along Kalanianaole Avenue, and all are only a few minutes drive from anywhere in Hilo. Tidal ponds provide safe and easy access for everyone to play in the ocean, while just a few metres away are rocks and surf to challenge even the most capable swimmers and surfers. Coconut Island, Banyan Drive and Liluokalani Gardens are all interesting destinations worth spending some time at…in fact, take a picnic lunch (“sack lunch” in Hawaiian), and plan to spend the day exploring Hilo Bay. Rainbow Falls and Boiling Pots Pools are both located right in Hilo on the Wailuku River, which flows into Hilo Bay. Although not as spectacular as other falls and rivers you might find on the Big Island, they are easy to get to, and certainly worth a look. Despite being an amateur astronomer, I didn’t manage to visit the Mauna Kea Visitor Center. It is a fairly easy drive from Hilo, and offers free nightly star gazing from this station located at the 9,500′ level on Mauna Kea. Please note, the big observatories are not located here – they are near the summit at the 14,500′ level! If you plan to go to the Visitor Centre, take a winter coat and check their website to ensure the weather will be clear. It may be raining in Hilo, but it could easily be clear on the mountain (or vice versa). I did visit the top of Mauna Kea and the observatories a few years later in 2014. October 20-23, 2009 – I stayed at the Old Hawaiian Bed & Breakfast for four nights. The place is situated in a nice part of town near the Wailuku River, and is owned and operated by Lory & Stewart Hunter. 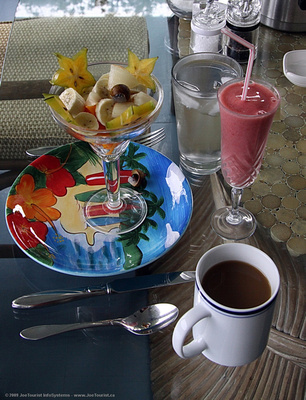 Lory’s superb breakfasts are served on the lanai (patio), and include fresh fruit smoothies, fresh baked pastries, cooked eggs, tropical fruit cocktail, and of course, Kona coffee. There are three rooms to choose from, and all guests share access to the large lanai, telephone, fridge, microwave, and high speed wireless Internet. There are no televisions in the rooms, so bring a notebook computer if watching videos or the news is important to you. JoeTourist recommended.